In his weekly Splash feature chief correspondent Jason Jiang assesses what hurdles wind power faces as a credible source of ship propulsion. Wind has been part of shipping for millennia, but in the 21st century it could be primed to sail back into real contention as a leading source of propulsion for maritime freight transportation, meeting the needs of penny pinching owners and green-expectant clients. Recent developments suggests the weather vane has tipped around back in favour of this erstwhile near universal form of shipping. Diane Gilpin, founder of the Smart Green Shipping Alliance, believes there is a huge potential for both growth and improved financial performance through deploying wind power on ships. Gilpin reckons there are about 15,000 ships in the global fleet suitable for wind propulsion. Gavin Allwright, who heads up the International Windship Association (IWSA), shares a similar view with Gilpin. Both Allwright and Gilpin think the biggest obstacle in the adoption of this form of propulsion is the lack of a clear target or a market leader to take a significant first plunge. “At present, shipowners suffer from the lack of leadership on a clear emissions reduction target. Pioneers risk being penalised in the wider market for trying early stage technologies. A clear target creates a level playing field and promotes a thriving culture of innovation,” maintains Allwright. Currently wind propulsion technologies are moving from design and late stage development into commercial deployment. Many of the technologies are ready for sea trials and appropriate vessels are being sought. Henning Kühl, head of marketing and business development at German company Skysails, reckons one of the development hurdles comes down to the economics. “This is on the one hand a question of economies of scale in production of wind propulsion systems and on the other hand a question of the fuel price level,” Kühl says, adding that another hurdle is the structure in the market. 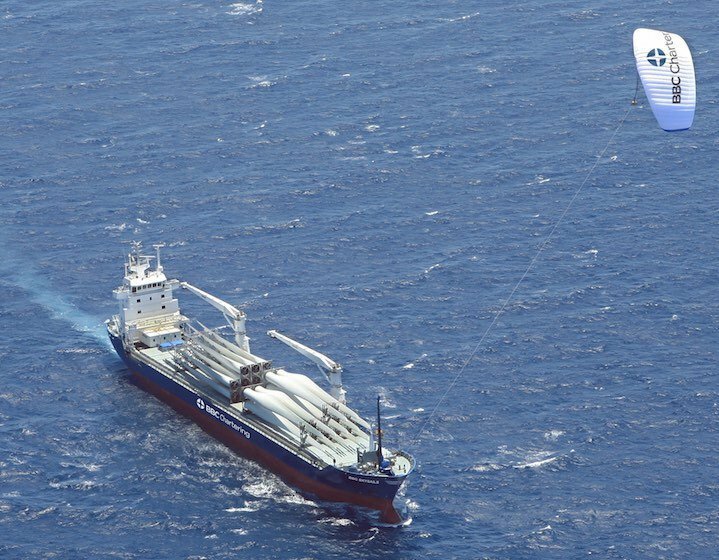 Skysails offers wind propulsion systems for ships and so far Skysails systems have been installed on one BBC Chartering ship for R&D purposes, and two ships of German owner Wessels, while another two ships of Wessels and one ship of Greek owner Anbros Maritime are expected to install the system soon. “Shipowners who have to make the investment quite often don’t pay for the fuel and thus save nothing, and the charterers normally do not charter the ship long enough to achieve breakeven and thus do not invest in fuel saving technologies like wind propulsion systems,” Kühl explains of the chicken and egg problem facing wind tech adoption onboard. Tuomas Riski, ceo and partner of Finnish company Norsepower, believes the ability to harness the wind as an additional power source to enable a reduction in fuel consumption is a natural next step for the maritime transport industry as it seeks to remain cost-efficient and meet environmental regulations. Norsepower offers renewable wind energy solutions for the global maritime industry. It delivered its Rotor Sail Solution on Finnish owner Bore’s roro vessel Estraden in 2015. “More installations of auxiliary wind propulsion solutions on different ship types will be needed in order to accelerate the growth of the market. Increasing delivery volumes of auxiliary wind propulsion technology will enable further optimization and cost-outs of the auxiliary wind propulsion technologies,” Riski says. Greg Atkinson, CEO of Japanese company Eco Marine Power, reckons that there is significant potential for wind to be used as a supplementary source of power or propulsion on ships, however he says it is difficult to estimate the market scale as there isn’t any large scale commercial deployments of wind power devices across shipping at the moment. “My expectation is that wind power and renewable energy in general will find a position in the market similar to air lubrications systems, propeller boss cap fins and waste heat recovery technologies, etc,” Atkinson says. In February, Eco Marine Power commenced a study in cooperation with several shipping companies to explore in detail how wind power can be used on ships. Atkinson says one barrier in terms of development for the company has been the difficulty in raising additional funds and the fairly conservative nature of the shipping sector as a whole, given the tough market situations in both shipping and the offshore sectors and another barrier is the “overhyped” claims by some of what wind power will do in terms of fuel savings. “Those of us developing wind power devices need to communicate realistic figures in terms of what our technologies can achieve in operational conditions otherwise shipping companies and shipyards will treat our claims with skepticism, and rightly so,” Atkinson warns. Volker Bertram, project manager at class society DNV GL says it looks as though interest in wind assistance is picking up. However, the slump in oil prices hasmeant that few owners have looked to pursue this option. There has also been an impression that savings potential has been too broadly stated and/or overestimated and the costs underestimated, Bertram adds. In Bertram’s opinion, the best option for a wind-assisted vessel would be for a ship operating mainly at slow speed in a region with higher average winds, such as the North Atlantic or Pacific. A wind assistance solution would also have to work with the ship itself and meet international and class guidelines and rules. Bertram suggests that to make such an investment there also needs to be greater confidence in the system suppliers as many have not been in operation for long enough and the market is fragmented, plus the systems themselves are often not mature; most are concepts rather than commercial products. “While fuel prices are low today, medium to long-term predictions suggest higher fuel prices, notably due to low sulphur fuel requirements. And higher fuel prices lead to lower ship speeds. Therefore, over time we could see the business case for wind assisted ships improve,” Bertram concludes. There are a number of reports on wind propulsion which give various estimates on the market potential, technology options, likely savings and estimated payback periods (see below). Obviously the retrofit and new build markets are very different and each segment of shipping has different requirements. IWSA will be increasingly working with both our technology provider members and the industry to provide third party verification of savings, routes etc.